Back pain is a common problem that compromises sleep quality for many people. This back pain may be caused by a variety of factors ranging from health problems to your sleeping position to the firmness or quality of the mattress you sleep on. In some cases, the back pain may be bad enough to wake you up from sleep. WE have also written a complete guide about the best pillows for backpain. If you often experience pain in your lower back when you wake up, what you need might be a high-quality mattress topper for back pain. These mattress toppers can provide you a more comfortable sleeping surface, helping relieve aches and pains in the lower back so you can get a full night of sleep. Thanks to the wide availability of sleep aid products today, there are many mattress toppers you can choose from. No matter what mattress you have, you can find a mattress topper that will help alleviate your back pain. What is a mattress topper for back pain? A mattress topper for back pain is a removable piece of bedding that can be fitted on top of your mattress. The mattress topper makes the mattress more comfortable so you can sleep in your preferred position without experiencing back pain or any other ache in your body. A high-quality mattress topper can also relieve back pain by ensuring that you get adequate cushioning and support. It adds softness to a mattress that’s too firm and improves the support of a mattress that’s too soft. This means you won’t have to spend money on getting an expensive new mattress. You’ll find many mattress toppers for back pain on the market today. These mattress toppers are made from a wide variety of materials, and all of these are capable of providing a sleeping surface that’s both supportive and comfortable. The most popular mattress toppers for back pain today are made from either memory foam or latex. Memory foam mattress toppers for back pain are effective because memory foam is able to conform to your body, which helps improves the alignment of your spine and neck. Memory foam can also memorize your body’s shape, so you can be as comfortable as possible as you sleep. This prevents back pain from developing and interrupting your sleep cycle. Latex foam mattress toppers for back pain are similar to memory foam mattress toppers in terms of providing relief from back pain. 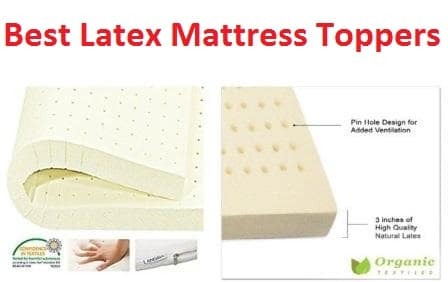 Most latex foam mattress toppers for back pain have pin core holes all over the surface; these holes can absorb your body weight and follow your body’s contours as well for maximum support and comfort. Mattress toppers for back pain can bring many benefits to people who suffer from chronic back pain and for those who usually wake up with aching bodies. Here are some of the most important benefits of using mattress toppers specifically designed to alleviate back pain. Pain relief – This is by far the most important benefit brought by these mattress toppers. 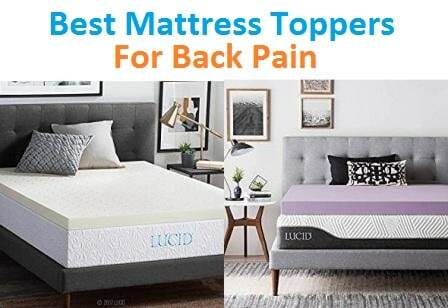 A mattress topper for back pain is specially designed to conform to your body and relieve the pressure points commonly affecting in the back, shoulders, and hips, no matter what position you sleep in. This ensures that your sleep won’t be disrupted by pain in your lower back and that you’ll wake up feeling refreshed and pain-free. Refreshes your mattress – A high-quality mattress topper can bring new life to your old mattress. Over time, some mattresses flatten out and offer less support and comfort, causing pain in your lower back and in other areas of your body. A mattress topper can restore your old mattress’ comfort and support levels so it feels like you’re sleeping on a fresh, brand-new mattress. Affordable – One of the best advantages of going for a mattress topper for back pain is that these are a more affordable alternative to buying a brand-new mattress. If your mattress is a little older and has begun to slightly sag, a mattress topper for back pain can ensure that it stays comfortable enough for you to sleep on every night. This way, you don’t have to spend money to buy an expensive new mattress. You’ll have many mattress toppers to choose from if you want a mattress topper for back pain. To make shopping for a mattress topper easier, consider the following features that can help determine if a mattress topper for back pain is the right choice for you. The best mattress toppers for back pain are usually made from memory foam or latex foam. These materials ensure that the mattress topper conforms to your body’s shape and relieves pressure points that commonly result in back pain. 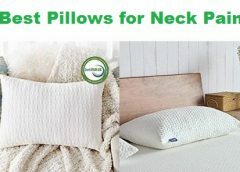 These mattress toppers also keep your spine and neck in proper alignment, whatever sleeping position you choose. This ensures that you can sleep comfortably and wake up feeling energized and refreshed instead of sore and tired. Mattress toppers for back pain come in a range of thicknesses, from two inches to four inches. If your back pain tends to be on the severe side, you’ll want a mattress topper that’s thicker, since thicker mattress toppers offer more cushioning and support. People with mild back pain may be able to be more comfortable on thinner mattress toppers that provide moderate levels of support. High-quality mattress toppers for back pain are designed to provide comfort as well. These mattress toppers often have covers that are breathable to encourage airflow throughout the mattress. Many mattress toppers also have layers that are infused with cooling gel to help keep you cool and comfortable as you sleep. Mattress toppers for back pain may have extra features that make them easier to use. Many mattress toppers, for instance, have covers that are removable and washable. Other mattress toppers for back pain may also have features that make them easier to secure to the mattress. The Sleep Innovations 4-Inch Dual-Layer King-Size Mattress Topper offers both support and comfort, thanks to a memory foam layer that remembers and cools down your body and a pillow-top layer for added softness and pressure relief. The Sleep Innovations 4-Inch Dual-Layer King-Size Mattress Topper has a support layer made from memory foam. Memory foam is designed to cradle your body and remember its shape, so your spine and neck are properly aligned. This way, back pain is not a problem no matter what position you sleep in. 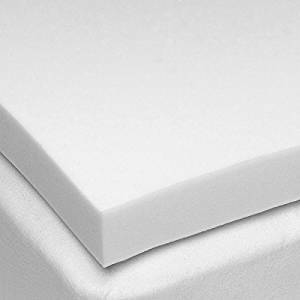 This mattress topper’s memory foam layer is designed to be responsive and durable, so it can last through years of use. This mattress topper is 4 inches thick, with each of its layers measuring two inches in thickness. This mattress topper is thick enough to give you the support needed to relieve back pain. Plus, this mattress topper is neither too soft nor too firm, thanks to the thickness of its memory foam layer. This balance ensures that your spine is in neutral alignment and that the topper itself properly responds to your body’s shape. The memory foam layer on the Sleep Innovations 4-Inch Dual-Layer King-Size Mattress Topper is infused with cooling gel. This cooling gel draws heat away from your body and disperses it so that you can sleep without feeling sweaty or hot. This mattress topper for back pain helps create the optimal sleep temperature to keep you more comfortable in bed. The Sleep Innovations 4-Inch Dual-Layer King-Size Mattress Topper features a removable cover that you can put in the washer for cleaning. You can even put the cover in the dryer so you can get right back to using it once it’s clean. This helps you keep your mattress topper fresh. 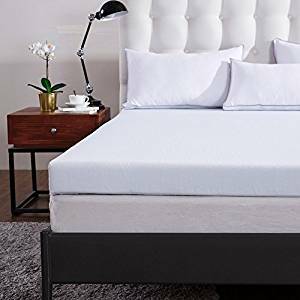 The ViscoSoft 4-Inch Queen Luxury Dual Layer Gel-Infused Memory Foam Mattress Topper features 2.5 inches of gel-infused memory foam for excellent support as well as a comfort layer filled with down alternative for superior softness. The ViscoSoft 4-Inch Queen Luxury Dual Layer Gel-Infused Memory Foam Mattress Topper has a support layer that’s made from high-quality memory foam. This memory foam layer is designed to support your neck and back, contouring to your curves to eliminate back pain and give you more comfortable sleep. This memory foam layer is also heavy and durable, so it can last longer than lightweight mattress toppers. In addition to its memory foam support layer, this mattress topper also has a quilted pillow top layer. This pillow top layer is 1.5 inches thick and filled with down alternative, providing an extra layer of comfort. This helps relieve pressure points and keeps you more comfortable as you sleep. The ViscoSoft Queen Luxury Dual Layer Gel-Infused Memory Foam Mattress Topper is 4 inches thick; its memory foam layer is 2.5 inches thick while its top comfort layer is 1.5 inches thick. This is the perfect thickness for a mattress topper; it’s not too thick to feel too firm and it’s not too thin to feel too soft. This way, your body gets sufficient support and comfort in bed and you can avoid getting pain in your lower back. The ViscoSoft Queen Luxury Dual Layer Gel-Infused Memory Foam Mattress Topper has a memory foam layer that’s infused with cooling gel. This cooling gel helps bring down your body’s temperature as you sleep, which greatly improves comfort. The mattress topper’s cover is also made from breathable fabric, so the mattress topper keeps you cool and helps you avoid getting sweaty as you sleep. What’s great about the ViscoSoft Queen Luxury Dual Layer Gel-Infused Memory Foam Mattress Topper is that it also minimizes motion transfer. This is thanks to the mattress topper’s support layer of high-quality memory foam. With this mattress topper, you won’t feel a thing even if your partner tosses and turns all night. This mattress topper also has straps on each corner inside the cover. This helps hold the memory foam layer in place over your mattress, so it won’t slip off even if you’re a restless sleeper. The sturdy elastic on this mattress topper can go all the way around mattresses up to 18 inches thick for added security. The Snuggle-Pedic Patented Double-Layer Viscoelastic Memory Foam Mattress Topper offers two layers of memory foam for superior support. Plus, this mattress topper is reversible, so you’ll get to choose the firmness level you want. The Snuggle-Pedic Patented Double-Layer Viscoelastic Memory Foam Mattress Topper has two layers of viscoelastic memory foam. 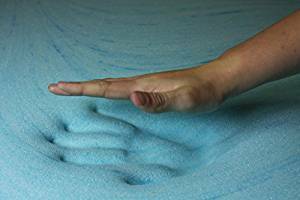 The first layer is made from memory foam with a 5-pound density, so it has a higher firmness level. This layer also offers twice the support of the mattress topper’s other side, which makes it ideal for people who need the firmness to deal with back pain. This firmer layer is also perfect for back and stomach sleepers. The mattress topper’s other layer is made from viscoelastic memory foam with a 4-pound density. This memory foam layer is much softer and acts as a reliable cushion for the shoulders and hips. This layer is great for people who prefer to sleep on a surface that has a little more give and for those who like to sleep on their sides. The Snuggle-Pedic Patented Double-Layer Viscoelastic Memory Foam Mattress Topper has a thickness of two inches. Though it’s only 2 inches thick, this mattress topper provides adequate support. The memory foam layer with the 5 pound-density prevents the softer layer from bottoming out and provides the support your body needs. This way, you don’t sink into the mattress like you would with other 2-inch mattress toppers. The dual memory foam layers of the Snuggle-Pedic Patented Double-Layer Viscoelastic Memory Foam Mattress Topper are designed to react to your body as you sleep, providing cooling comfort when needed and adjusting your sleeping temperature. This temperature sensitivity ensures that you don’t overheat during the night. The Snuggle-Pedic Patented Double-Layer Viscoelastic Memory Foam Mattress Topper is hypoallergenic, making it a great mattress accessory for people who suffer from allergies and sensitivities. For added hygiene, this mattress topper is also resistant to dust mites. The Memory Foam Solutions 3-Inch Viscoelastic Memory Foam Mattress Topper features high-quality memory foam that supports your spine and neck. This memory foam layer is temperature-sensitive, too, so you can always sleep in comfort. The Memory Foam Solutions 3-Inch Viscoelastic Memory Foam Mattress Topper is made from viscoelastic memory foam. This viscoelastic memory foam layer has a density of four pounds, so it’s just firm enough to support your spine and neck as you sleep. No matter what position you sleep in, this mattress topper provides adequate support so you won’t experience back pain. This is a great mattress topper to get if your mattress doesn’t evenly provide support due to sagging or dipping. The Memory Foam Solutions Viscoelastic Memory Foam Mattress Topper is 3 inches thick. This mattress topper is just the right thickness so that you won’t sink into the mattress underneath. A mattress topper of this thickness is also not too firm or too soft, so it won’t cause any discomfort or aggravate existing back pain problems. The 3-inch thickness of the mattress topper also ensures that’s not too heavy, so placing it on your mattress is not a problem. The Memory Foam Solutions Viscoelastic Memory Foam Mattress Topper features memory foam that is temperature-sensitive. The memory foam layer conforms to your body at temperatures between 60 to 70 degrees, giving you relief from the pressure points that cause you to toss and turn all night. This mattress topper also helps lower your body temperature so you can be more comfortable in bed. The Memory Foam Solutions Viscoelastic Memory Foam Mattress Topper exceeds PURGreen certifications, so you can be sure that this mattress topper is of high quality. This ensures that the mattress topper can last through years of frequent use. The LUCID 3-Inch Ventilated Memory Foam Mattress Topper helps relieve back pain through its plush memory foam layer. The memory foam’s surface is also ventilated to help regulate your sleeping temperature. The LUCID 3-Inch Ventilated Memory Foam Mattress Topper features a single memory foam layer. This memory foam layer is capable of providing sufficient support so that your neck and spine are always properly aligned. Memory foam also has the ability to follow and remember to your body’s shape, so your shoulders and hips are supported whether you sleep on your back, side, or stomach. Plus, the mattress topper’s memory foam layer features open cell technology, which prevents lasting body impressions from forming in the foam. All these support and comfort features help you avoid waking up with an aching back and ensure that you get quality sleep each night. The LUCID 3-Inch Ventilated Memory Foam Mattress Topper is 3 inches thick, which is ideal for people of different sizes and for most sleeping positions. At this thickness, the mattress offers just the right firmness, so you can be as comfortable as possible. This helps eliminate the cause of back pain, so you can wake up feeling refreshed instead of sore. Being only 3 inches thick, this mattress topper is also not too heavy, so you can easily place it on your mattress. 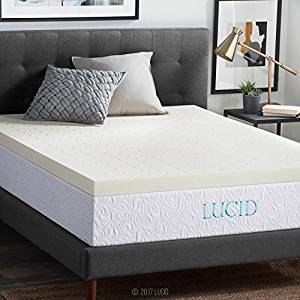 The LUCID 3-Inch Ventilated Memory Foam Mattress Topper is a ventilated mattress topper, so its surface features hundreds of holes that are evenly sized and spaced. These ventilation holes help promote airflow throughout the mattress topper, improving the mattress topper’s breathability. This helps you sleep at an optimal temperature and keeps you more comfortable in bed. The LUCID 3-Inch Ventilated Memory Foam Mattress Topper is resistant to allergens and dust mites, so you can be sure that the mattress topper won’t trigger allergies and sensitivities. The ExceptionalSheets Bamboo Mattress Pad with Fitted Skirt is a plush mattress topper with a down alternative filling that helps relieves pressure and keeps back pain at bay. Plus, the cover is completely hypoallergenic for added comfort. The ExceptionalSheets Bamboo Mattress Pad with Fitted Skirt is filled with a material called Revoloft. Revoloft is a state-of-the-art fiberfill material that feels just like authentic goose and duck down. This fiberfill material traps air for extra fluffiness and comfort. This mattress pad helps relieve back pain by making your mattress more comfortable. This way, you get a soft, plush sleeping surface without the feeling of feathers poking at you through the cover. This mattress pad can deliver superior support and comfort, no matter what position you sleep in. The ExceptionalSheets Bamboo Mattress Pad with Fitted Skirt is 1.5 inches thick. This mattress pad is just the right thickness to give you the comfort and support you need for back pain relief. It’s not too thick that it’s too firm for you to get comfortable, but it’s also not too soft that your body sinks into it and you feel your mattress instead. 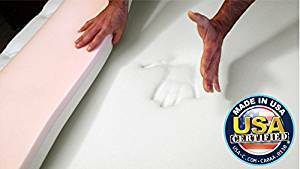 This mattress pad gives you an easier, more affordable way to restore your mattress’ comfort levels, especially if your mattress has been sagging or dipping in some spots. The ExceptionalSheets Bamboo Mattress Pad with Fitted Skirt is made from rayon from bamboo blend fabric. This rayon material not only makes the mattress pad’s cover soft and smooth but also helps regulate body temperature. The mattress pad helps stabilize your temperature so you don’t get too hot as you sleep, which greatly improves comfort and prevents back pain problems from getting worse. The ExceptionalSheets Bamboo Mattress Pad with Fitted Skirt is designed to be easy to put on your mattress, thanks to its unique elastic skirt. With this elastic skirt, you can fit the mattress pad over mattresses up to 18 inches thick. No matter what type of mattress you have, this mattress pad can improve its comfort and support abilities. The LUCID 4-Inch Lavender-Infused Memory Foam Mattress Topper features a layer of plush memory foam that helps keep your spine aligned. Plus, the memory foam’s lavender infusion promotes calming and relaxation in bed. The LUCID 4-Inch Lavender-Infused Memory Foam Mattress Topper offers a layer of therapeutic memory foam. This memory foam layer helps keep your spine and neck aligned, no matter what position you sleep in, so you can wake up without back pain. The memory foam also relieves pressure points by contouring to your body’s shape. With this memory foam mattress topper, you can wake up feeling refreshed and pain-free. 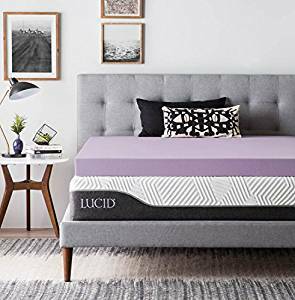 The LUCID Lavender-Infused Memory Foam Mattress Topper is 4 inches thick, which is a great thickness level for mattress toppers. For this mattress topper, the 4-inch thickness of the memory foam layer allows for a deeper sink. This way, the mattress topper cradles your body more than a thinner mattress topper can. This way, you can be more comfortable in bed, whether you sleep on your side, back, or stomach. The LUCID 4-Inch Lavender-Infused Memory Foam Mattress Topper has a ventilated design. Its surface features multiple holes that promote airflow and improve the breathability of the mattress topper. This keeps you more comfortable in bed and helps you avoid waking up in the middle of the night because of overheating. This is particularly helpful because heat can aggravate back pain problems. What’s great about the LUCID 4-Inch Memory Foam Mattress Topper is that it’s infused with lavender essential oils. This essential oil infusion creates a naturally calming and relaxing sleeping environment. This helps you fall asleep easier and minimizes interruptions to the sleep cycle, so you can sleep throughout the night. The Best Price Mattress 4-Inch Memory Foam Mattress Topper helps prevent back pain through its memory foam layer, which conforms to your body. Plus, a high-density base foam layer ensures that you get adequate support. The Best Price Mattress 4-Inch Memory Foam Mattress Topper is made from high-quality memory foam. The mattress topper’s memory foam layer offers sufficient support so that your neck and spine are properly aligned. This prevents you from experiencing back pain, whether you sleep on your back, stomach, or side. What’s great about this mattress topper is that it has a base layer of high-density foam. This base layer is 2.5 inches thick, so it can prevent you from sinking into your mattress. The Best Price Mattress Memory Foam Mattress Topper is 4 inches thick. This mattress is just the right thickness so that it provides sufficient firmness. With this mattress topper, you won’t be uncomfortable because your mattress is too stiff or too soft. The thickness of the mattress topper also allows it to cradle your body more so you can be more comfortable in bed. This mattress topper has just the right amount of give, so you get the perfect amount of support and comfort. 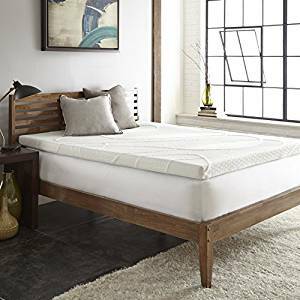 The Best Price Mattress 4-Inch Memory Foam Mattress Topper is designed to maintain the optimum sleeping temperature, so you can sleep throughout the night without feeling hot and sweaty. This helps you be more comfortable in bed and prevents any existing back pain from getting aggravated. The Best Price Mattress 4-Inch Memory Foam Mattress Topper also features responsive active suspension, which isolates motion and prevents the motion for spreading across the mattress topper. This means you won’t disturb your partner even if you toss and turn all night or if you often get up from bed. The Advanced Sleep Solutions 2-Inch Medium Soft Memory Foam Mattress Topper gives you the comfort you need through a 2-inch memory foam layer that relieves pressure and ensures proper spinal alignment. The Advanced Sleep Solutions 2-Inch Medium Soft Memory Foam Mattress Topper features a single layer of memory foam. This memory foam layer is designed to make sleeping more comfortable by giving you sufficient support. With this mattress topper, you can sleep in any position you want and keep your neck and spine aligned. This helps prevent back pain from developing and ensures that you won’t wake up feeling tired and sore. This Advanced Sleep Solutions memory foam mattress topper can also reduce pressure points in the back, neck, and hips. The mattress topper has an open cell structure design that expands to ensure even weight distribution, which helps relieve pressure points. The Advanced Sleep Solutions Medium Soft Memory Foam Mattress Topper is 2 inches thick. It’s thinner than many mattress toppers on the market today, but it can still offer the support you need to sleep comfortably. This mattress topper is on the medium soft side, too, so it can give you a high level of comfort, especially if your mattress has developed some sagging spots or has begun dipping due to age. The Advanced Sleep Solutions 2-Inch Medium Soft Memory Foam Mattress Topper has a foam layer that’s constructed using the latest polymer technology. This helps maximize comfort, whether you’re in warmer or cooler climates. The technology also helps minimize stiffness, so you can truly get comfortable in bed. The Advanced Sleep Solutions 2-Inch Medium Soft Memory Foam Mattress Topper is designed to be easy to place onto the mattress. The mattress topper is an inch shorter than standard mattresses so it can fit under most fitted sheets. The mattress topper can also be quickly rolled up, making it easy to take it with you when you travel. 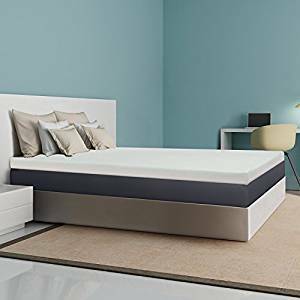 The Nature’s Sleep Cool IQ Viscoelastic Memory Foam Mattress Topper with Microfiber Fitted Cover and 18-Inch Skirt is designed to react to the sleeper’s body to increase airflow and improve comfort. Plus, this mattress topper is naturally hypoallergenic and anti-microbial for added convenience. The Nature’s Sleep Cool IQ Viscoelastic Memory Foam Mattress Topper with Microfiber Fitted Cover and 18-Inch Skirt features a layer of viscoelastic memory foam. 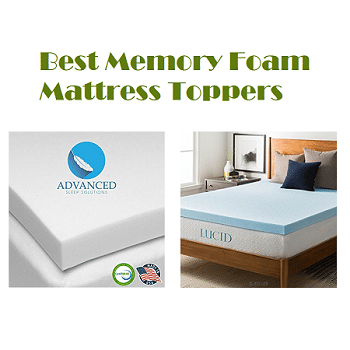 This memory foam layer features larger open memory foam cells that improve the mattress topper’s ability to support your body and keep the spine and neck in proper alignment. This helps you avoid back pain and ensures that you always get a good night’s sleep. This mattress topper also minimizes pressure points, so you can stay comfortable no matter what position you sleep in. By relieving pressure points, this mattress topper also helps you avoid tossing and turning and prevents you from experiencing aches and pains not just in your back but also in your neck, hips, and shoulders. The Nature’s Sleep Cool IQ Viscoelastic Memory Foam Mattress Topper with Microfiber Fitted Cover and 18-Inch Skirt is 2.5 inches thick. This mattress topper is the right thickness so that it buoys your body up and prevents you from sinking into your mattress. This mattress topper is an excellent accessory for mattresses that have begun to sag or dip due to age. 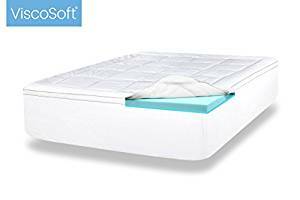 The Nature’s Sleep Cool IQ Viscoelastic Memory Foam Mattress Topper with Microfiber Fitted Cover and 18-Inch Skirt features lighter foam viscoelastic technology. With this technology, the mattress topper contains larger open memory foam cells that increase airflow as it reacts to your body. This makes the mattress topper highly breathable, so you can enjoy a cooler sleeping environment. The Nature’s Sleep Cool IQ Viscoelastic Memory Foam Mattress Topper is naturally hypoallergenic and anti-bacterial. This improved hygiene makes the mattress topper a great choice for people suffering from allergies and asthma. This mattress topper also comes with a microfiber fitted cover, which helps improve comfort, and an 18-inch skirt that helps hold the mattress topper in place. 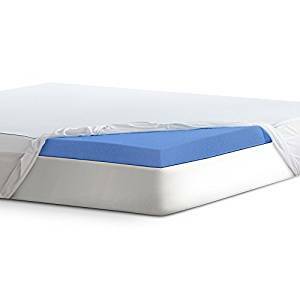 The Comfort & Relax 3” Gel Memory Foam Mattress Topper with Washable Cover offers gel-infused memory foam to relieve pressure points and eliminate motion transfer. Plus, the gel infusion of the memory foam layer also helps create the optimum sleeping temperature. The Comfort & Relax 3” Gel Memory Foam Mattress Topper with Washable Cover offers a single layer of high-quality memory foam. This layer of memory foam is designed to conform to your body’s curves, providing improved pressure relief and keeps your spine and neck properly aligned. 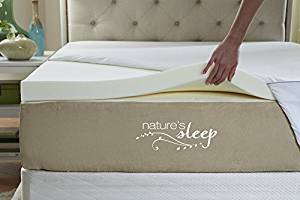 By supporting the natural curves of the head, neck, and shoulders, this mattress topper helps prevent back pain no matter what position you sleep in. 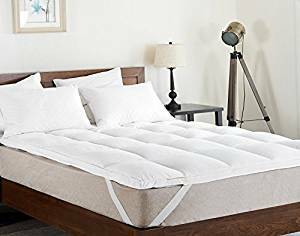 The Comfort & Relax Gel Memory Foam Mattress Topper with Washable Cover also improves comfort and helps keep you from tossing and turning all night, so you can wake up feeling well-rested. This mattress topper can provide equal, balanced support for the whole body. The Comfort & Relax Gel Memory Foam Mattress Topper with Washable Cover is 3 inches thick. This is just the right thickness level to give you the perfect balance of support and comfort. The mattress topper is not too thick that it’s too firm for you to be comfortable and not too plush that you sink right through it and onto your mattress. This mattress topper gives you the perfect amount of bounce and firmness, so it’s a great accessory for a sagging mattress or for a mattress that’s dipping in areas. The Comfort & Relax Gel Memory Foam Mattress Topper with Washable Cover features open-cell memory foam. This design helps keep you cool as you sleep by promoting airflow throughout the mattress topper. By helping maintain an optimum sleeping temperature, the mattress topper improves the quality of your sleep every night. The Comfort & Relax Gel Memory Foam Mattress Topper also comes with a durable cover. The mattress topper’s cover is made from premium polyester pongee fabric, so the cover is breathable, resilient, and highly flexible. This cover is washable, too, making it easier for you to keep the mattress topper fresh and clean. The Perfect Cloud 2-Inch Gel Fusion Memory Foam Mattress Topper has a gel-infused memory layer to help keep you cool and prevent the discomfort of back pain. The mattress topper’s premium knit cover is also completely removable for easy cleaning. The Perfect Cloud 2-Inch Gel Fusion Memory Foam Mattress Topper offers a layer of memory foam that’s designed to follow your body’s shape. As it cradles your body, the memory foam layer gives you the support you need to keep your spine in proper alignment. This way, you can avoid back pain and wake up feeling well-rested. Aside from eliminating back pain, this mattress topper can also ease nervous tension and give you a more relaxed sleeping environment. This mattress topper is made only from responsive materials, so it can accommodate sleepers of all weights. No matter what position you sleep in, this mattress topper can help you sleep better. The memory foam layer of the Perfect Cloud 2-Inch Gel Fusion Memory Foam Mattress Topper is infused with cooling gel. This cooling gel infusion helps you sleep more comfortably by maintaining an optimum sleeping temperature while you’re in bed. This helps prevent overheating and keeps you from tossing and turning all night because you feel hot. The cooling effect of the memory foam layer also eases back pain by improving your level of comfort. The Perfect Cloud 2-Inch Gel Fusion Memory Foam Mattress Topper comes with a top-of-the-line premium knit cover. This stretch knit cover has a soft, plush feel, so it makes the mattress topper even more comfortable to sleep on. The mattress topper’s cover is easily removable so you can clean dirty spots as needed. This makes it easier for you to keep the mattress topper fresh and clean. The Serta 3-Inch Memory Foam Mattress Topper offers memory foam with a density of 3.5 pounds so it can give your back the support it needs while keeping you comfortable. With this mattress topper, you can always enjoy restful, uninterrupted sleep. The Serta 3-Inch Memory Foam Mattress Topper has a layer of premium memory foam. This memory foam layer is designed to adjust your body’s shape, so it cradles your body whatever position you sleep in. By adapting to your body’s shape, this memory foam mattress topper helps relieves pressure points and eases tension in areas like the back, shoulders, and hips. By relieving pressure points, this Serta memory foam mattress topper also keeps you from tossing and turning all night. This ensures that you get deep, restful sleep each night, so you can wake up feeling fresh and energized. With this mattress topper, you can make your bed more comfortable again without the cost and hassle of replacing your old, sagging mattress. The Serta Memory Foam Mattress Topper is designed to keep you more comfortable at night by keeping your sleeping temperature at the right levels. This mattress topper helps keep you cool as you sleep, so you don’t have to worry about waking up hot and sweaty. By lowering your body’s temperature, this mattress topper improves the quality of your sleep each night and allows you to wake up feeling well-rested and refreshed. The Serta Memory Foam Mattress Topper gives you a more affordable way to restore your mattress’ firmness level. This is particularly helpful if your mattress has begun to sag and dip and spots and you don’t have room in your budget for a brand-new mattress. With this mattress topper, you don’t have to break the bank just to sleep more comfortably each night. The Cheer Collection Extra Plush Luxurious Down Alternative Mattress Topper gives you a soft sleeping surface through its filling of down alternative material. This helps ease back pain and improves your level of comfort for better-quality sleep each night. The Cheer Collection Extra Plush Luxurious Down Alternative Mattress Topper is an excellent mattress topper that can help relieve back pain. This extra plush mattress topper is filled with high-loft microfiber fill, giving you an extremely comfortable surface to sleep on. The mattress topper is overstuffed, too, soo you can enjoy improved comfort as you sleep. Of course, this mattress topper also gives you the support you need. With this mattress topper on your mattress, you can sleep in any position you want and enjoy proper alignment for your neck and spine. This helps you wake up without pain in your back and other areas like your hips and shoulders. The Cheer Collection Extra Plush Luxurious Down Alternative Mattress Topper is 2 to 3 inches thick. With this thickness, you can be sure that the mattress topper will provide you with the softness and support you need for maximum comfort. The queen-size mattress topper contains 50 oz. of down alternative fill, so you’ll get plenty of softness to help ease back pain and relieve various aches. This mattress topper has a plush pillow-top surface that you’ll enjoy sinking into after a long, tiring day. Its comfort features make it a great mattress topper even for pregnant women, the elderly, and people recovering from surgery. The Cheer Collection Extra Plush Luxurious Down Alternative Mattress Topper is made only from breathable materials. This ensures that air easily flows through the mattress topper, keeping you cool and comfortable in bed. By improving airflow through your sleeping surface, this mattress topper helps maintain the optimum sleeping temperature. This way, you get a sleeping environment that’s conducive to restful, refreshing sleep. The Cheer Collection Extra Plush Luxurious Down Alternative Mattress Topper features double needle stitching and a baffle box design. These ensure that the down alternative filling is evenly distributed and prevents clumping or shifting. This prevents uneven spots that cause pressure points. This extra-plush mattress topper also has built-in elastic corner bands that make it easier to secure onto mattresses. This mattress topper can fit mattresses up to 18 inches deep, so it can fit most mattresses. For added hygiene, the mattress topper can block allergens such as pollen, mold, or pet dander, so you can sleep more comfortably each night. The PharMeDoc Memory Foam Mattress Topper gives you all the comfort you need through its layer of body-conforming memory foam. The memory foam’s soft active suspension abilities also ease pressure points and help keep back pain at bay. 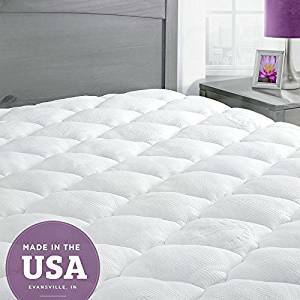 This is an excellent mattress topper for anyone who wants to enjoy pressure point relief and avoid tossing and turning all night.